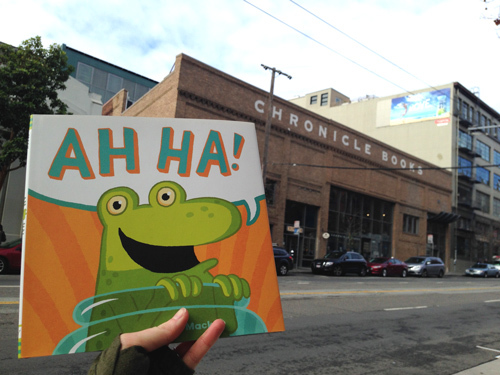 I know it's February today, but I couldn't resist waiting until my business trip to San Francisco earlier this week to take the opportunity to stop by Chronicle Books to pick up a book for my January book review. I unfortunately did not have enough time to tour Chronicle, but I enjoyed perusing the beautifully designed titles in their storefront. Flora and the Flamingo was absent, but I assume it was getting a sticker makeover for it's Caldecott Honor. Carnivores was in my hand, since I am an ongoing fan of Dan Santat. But in the end, I chose a title from an artist I wasn't too familiar with, but whose use of language intrigued me greatly. Ah Ha! has exquisitely sparse text. Two letters used two times each, in playful combinations that emphasize the action and emotion of each spread depicting a frog's journey and adventures in the world. At the height of action, there are a total of 12 letters on a single spread. Throughout the book, this restraint is paired with beautifully simplified, graphic pictures that perfectly complement the words. And the colors! Bold and lush, even the earth tones are like candy. I really did have two sets of perfect pages, the one below and the following spread with one of my favorite colors dominating the page. I chose this spread because even in the quiet moments there is still such life, expression, and storytelling in each scene. Graphic shapes and simple colors with comic-style text bubbles. Isn't the reflection fabulous?